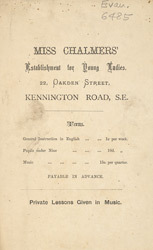 This is an advertisement for Miss Chalmers Establishment for young ladies. Education for females in the 19th century was in general reserved for sons rather than daughters, and a girl’s needs were often sacrificed to those of her brothers. Education offered to females was usually based in the home or in small rooms in a female instructor’s house. Learning was focused on household skills that they would need in future life such as dressmaking and needlework or on past times that could be enjoyed in the home such as music and painting.